Archivematica supports the ingest of materials packaged in accordance with the Library of Congress BagIt specification. Users can ingest both zipped and unzipped bags by using the appropriate transfer type. Unzipped bags can be created by hand or by using a BagIt tool like BagIt-python or Bagger. The bag must comply with the BagIt specification. To ingest an unzipped bag, select Unzipped bag from the transfer type dropdown menu in the Transfer tab and then select your material from the transfer browser. The screenshot above shows a simple bag containing three digital objects to be preserved (LICENSE, README, and TRADEMARK) as well as the accompanying files required by the BagIt specification (bag-info.txt, bagit.txt, and a manifest file, in this case for sha512 checksums.) Note that the digital objects to be preserved are within a subdirectory called data. For more information on processing your transfer, see process transfer on the Transfer page. Zipped bags can be created by hand or by using a BagIt tool like BagIt-python or Bagger. The bag must comply with the BagIt specification. To ingest a zipped bag, select the transfer type Zipped bag from the dropdown menu in the transfer tab of the Dashboard. When you open the transfer browser, you will notice that only materials that use the compression formats .zip, .tgz, or tar.gz can be selected for transfer. These are the only compressed formats that Archivematica accepts for zipped bag transfers. The bag itself should be structured internally like an unzipped bag, as shown above. Note that zipped bag transfers always use the name of the bag as the transfer name. Similar to standard transfers, it is possible to add descriptive and rights metadata to unzipped and zipped bag transfers. We recommend creating the bag first, then adding the metadata directory and the metadata.csv and/or rights.csv file manually. You can also add submission documentation to the bag by adding a submissionDocumentation directory inside the metadata directory. Even though the metadata directory, submissionDocumentation directory, and contents are not represented in the BagIt files (i.e. the checksum manifests), Archivematica will ignore the metadata directory during Job: Verify bag, and restructure for compliance so that the bag is verified successfully. Archivematica will then parse the metadata as usual. Note that the filename paths in the CSV files must reflect the structure of the bag. For more information about adding metadata and submission documentation to transfers in Archivematica, please see Preparing digital objects for transfer. In Archivematica 1.4 and higher, fields in the bag-info.txt file are indexed as source metadata in Elasticsearch, making their contents searchable in the Archival Storage tab after the bag transfer has been stored. Labels in the bag-info.txt file are serialized as XML in the METS sourceMD field and linked to the objects directory of the AIP. For example, the bag-info.txt might include the following information (sample provided via https://tools.ietf.org/html/draft-kunze-bagit-10). In order to be parsed into the METS file, bag-info.txt labels (i.e. Source-Organization) must be compliant with XML so they cannot contain spaces or forbidden characters. 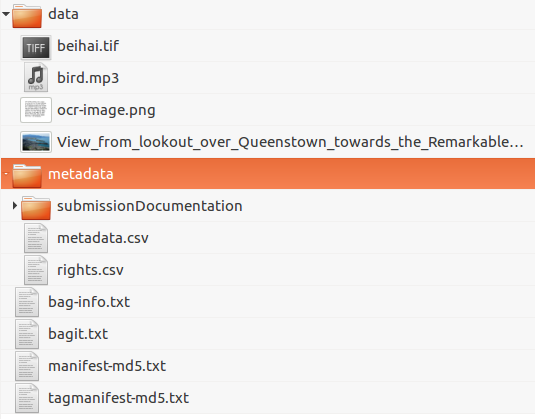 The metadata contained within the <transfer_metadata> tags can now be used for searching on the Archival Storage tab. Searching for any of the terms (i.e. Spengler University) in the bag-info.txt using the search parameter Any should display stored packages that includes the search term in any field (or in the AIP name, etc. as per Searching the AIP store). In the above example, the AIP coyote contained the search phrase in the descriptive metadata, rather than bag-info.txt. The other two AIPs contained the search phrase in bag-info.txt. You can narrow the search results to just search the metadata that comes from bag-info.txt by selecting Transfer metadata as the search parameter. This will search for anything within the <transfer_metadata> tags in the METS file. You can narrow the search results even further by using the Transfer metadata (other) search parameter, which allows you to define the specific sub-field within the <transfer_metadata> that you want to search. For example, you may want to search for AIPs where the search phrase “Spengler University” is present in the Source-Organization field, but not other fields.